Twelve of my delicious fresh baked from scratch cookies. Each cookies is individually packaged in a resealable cello bag to preserve freshness. We then carefully pack them in our eco friendly kraft gift box with a matching organza polka dot bow. The price stated is for 12 but you can select 6, 12, 18, or 24 pieces and the price will adjust accordingly. Twelve of my delicious fresh baked from scratch cookies. Each cookies is individually packaged in a resealable cello bag to preserve freshness. We then pack them in our eco friendly kraft gift box with a matching organza polka dot bow. 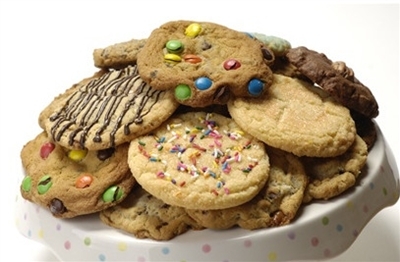 Next time you’re planning an event or hosting a party, why not add some freshly baked cookies into the mix? Ali’s Cookies makes it oh-so-easy to have chocolate chip, sugar or chocolate cookies delivered anywhere in the United States, for any occasion. Have a dozen individually wrapped cookies delivered to the office for a team reward for a job well done, as a birthday treat or for any reason at all. Ordering is a breeze, and we have the logistics down to a science. Tell us which flavors you want and when you need them, and we’ll handle the rest!